For engineering excellence and breath-taking scenery, there are few rail journeys finer than Sri Lanka’s Viceroy Special, the country’s only steam train. Experience its delights by private charter on a 12-day escorted tour for rail connoisseurs that ticks off Sri Lanka’s myriad attractions and basks in balmy day-time temperatures in the low 30°Cs. Departing 28 February, Explore Sri Lanka by Rail costs from £4,445 pp (two sharing) including flights (Heathrow), rail/coach journeys and excursions as per the itinerary, ten nights’ B&B, welcome dinner, ten lunches, and the services of a tour leader and local guide. One overnight flight. After 60 years living in London, ‘Richard Wilson’s Highland Fling’ (More4, 19 October at 9pm) accompanies the popular actor, famous as Victor Meldrew in 'One Foot in the Grave', as he explores the myriad delights of his native Scotland. Make your own memories on a 14-day escorted tour of the Scottish Highlands that features a steam ship cruise on Loch Katrine, visits to Stirling, Crathes & Braemar Castles, a full day on Orkney, and rides on the Strathspey Steam Railway, the Kyle of Lochalsh line and the famous Jacobite steam train. Departing 16 September 2018, the price is from £2,150 pp (two sharing) including rail travel, 13 nights’ B&B, welcome & farewell dinners, excursions and tour leader. This autumn break in scenic North Wales offers a three-night stay at the famous Italianate Portmeirion Village, plus the chance to experience the magnificence of Snowdonia from over 40 miles of scenic railway. The price is from £350 pp (two sharing) including three nights’ B&B and return journeys on the Ffestiniog and Welsh Highland Railways. Travel by 5 November 2017. Rail holiday specialist Ffestiniog Travel has released the 2018 edition of its popular escorted tours brochure. 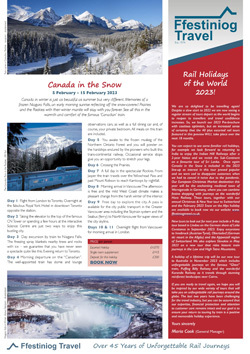 Featuring six new escorted itineraries for next year - from the tramways of south-eastern France to the logging railroads and coastal routes of California - Rail Holidays of the World also tempts travellers to start planning for this year’s festive season, with a new Christmas Markets break to the Swiss city of Basle as well as the chance to see in the New Year in Romania.